Total Audio Tags View add delete or and edit audio tags with user-friendly Total Audio Tags. O in short: Total Audio Tags is a powerful tool to help you view add delete or edit tags of your audio files. Tags to edit: title album artist track genre year composer copyright language encoder file Size bitrate duration channels sample rate. Do you feel that tags like Unknown Album are not worth having? 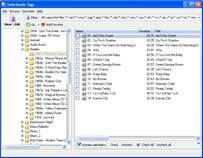 Total Audio Tags will help you create a perfect music collection. Most songs downloaded from the web have crippled or not full tags. Total Tag Editor changes the situation. It allows you to view and edit the tags of your songs as you like. Add full info to the tags like title, artist, album, track, year, genre, composer, copyright, encoder, language. A good music collection deserves it! Besides, Total Audio Tags can export the tags to HTML, CSV, TXT, or XML. You will get full report about your songs! Total Audio Tags can handle both ID3v1 and ID3v2 tags. It's easy-to-use and very powerful. Total Audio Tags can be handled via GUI or command line. Batch processing is also available if you want to edit tags of several songs at once. Total Audio Tags does what it says. Download it now for free and try it out yourself. We are sure your songs deserve it! See above information and user's reviews about Total Audio Tags View add delete or and edit audio tags with user-friendly Total Audio Tags.